Doris doesn’t discuss reading at a great length within her autobiography but the little that she does mention in regards to the subject I consider to be quite interesting. She tells that she grew up during a time before radio and television and that ‘reading was one of very few indoor relaxations, so naturally children did more reading than they do perhaps today’ (p2). This tells us that children saw reading as a source of entertainment before the days of radio and TV arrived. This contrasts heavily with our current period as due to all of the other means of entertainment available, reading has taken a back seat. Near the beginning of Doris’s autobiography she writes about her family’s stay at her grandfather’s house whilst her father was working nearby. At this time Doris was around the age of 6-7 years and she borrowed a Charles Dickens book from her Uncle Joe. 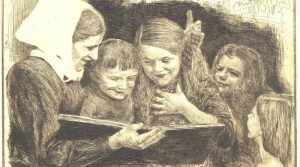 Perhaps Doris connected with Dickens’ writing because, as Pamela Makati suggests, his ‘novels provide a historical representation of the conditions experienced by the poor and the plight of children and women in the Victorian society and their quest for survival in an industrialised society’ (Makati, 2008, 5). Dickens’s influence on society during Doris’s childhood was measured in a survey in 1906 discussed by Jonathon Rose. The survey was taken by Labour Members of Parliament and they were asked to name the books and authors that for them, held the most influence. 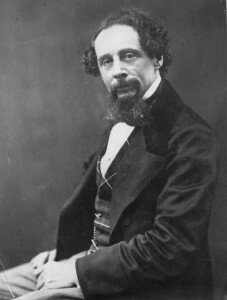 Their response shows that Dickens came second with 16 votes, one vote behind leader John Ruskin. However, the respondents to the survey were all male, left wing politicians. As Jonathon Rose tells us that ‘if our sample had been more representative of the working class, the above list would have included more literature and less politics and economics (Rose, 1992, 56). But as Rose points out ‘Dickens provided working people with the inspiration and the generic literary conventions they needed to tell their own stories’ (Rose, 1992, 61). The book Doris borrows from her Uncle Joe was Bleak House. Doris tells us that ‘of course I found it hard going’ as anyone at the age of 6 would, although, she did manage to finish a few chapters before she left her grandfathers house (p2). 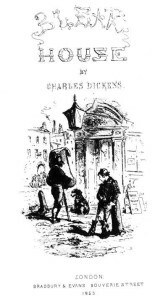 In this novel Dickens makes his frustration with the English legal system explicitly clear. His anger was directed at the fact that instead of serving the people, the English legal system seemed to serve only itself with its impenetrable bureaucracy. This links to Doris, as in her writing she discusses the ‘Pre Welfare State’ and how her father received no support from the state when he became too ill to travel for work, just two weeks before his death. Doris can’t resist making sure that we know Dickens did not defeat her as she tells us ‘in succeeding years I read every single one of Dickens’ novels before I ever tackled ‘Bleak House’ again’ (p2), proving to us that she could finish the book she initially struggled with. As Doris writes in her memoir, ‘Literature is something one must grow into, not be pushed into, like a non-swimmer into the deep end’ (p1). Towards the end of Doris’s autobiography, she points out how important teachers can be in fostering children’s love of reading. After seven years in Mr Nuttall’s classes she had ‘acquired a deep love of English Literature’ (p11).